We currently have no need for elites until our gyms are all filled, and when that time comes some gym leaders might promoted to elite. Okay, so as I was going to say. 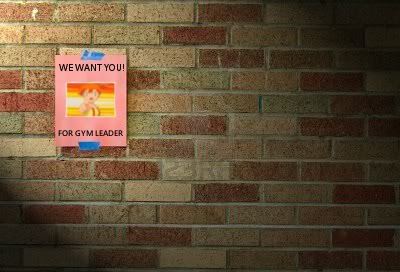 The gym is currently unfilled so if you wish to be a gym leader, you can PM me. If I already know you're a good battler I'll promote you automatically, but if not I'll have to figure out a time to battle you. I can do 4th and 5th but I wanted my gyms to be more 4th based, so if you can only do 5th I'll probably not promote you. SO. If you have a good 4th gen team, PM me! If you have 4th AND 5th, even better! Just let me know! Further more... Time to put up posters!